FiftyFlowers just added 3 New Amaryllis Colors… Peach, Mocha and Green! Amaryllis Flowers are big, beautiful flowers that can make quite a statement when placed in a bouquet or arrangement. To prove that point we have Violet, our resident wedding flower planner, here today to share a Bouquet Breakdown! I am SOOO excited that we are now carrying my *very* favorite amaryllis color! These amazing sized blooms are a wonderful way to make a statement with your bouquet!! I found this lovely Bouquet on one of my favorite wedding blogs, Green Wedding Shoes. It was created by Plenty of Petals for a gorgeous waterside wedding in San Diego, CA. See More from the wedding here. The pops of chocolate, red and deep pink against the soft pinks and peaches is perfection, plus the addition of wild greens…Just Gorgeous. Special Thanks to Diana McGregor for the beautiful image. 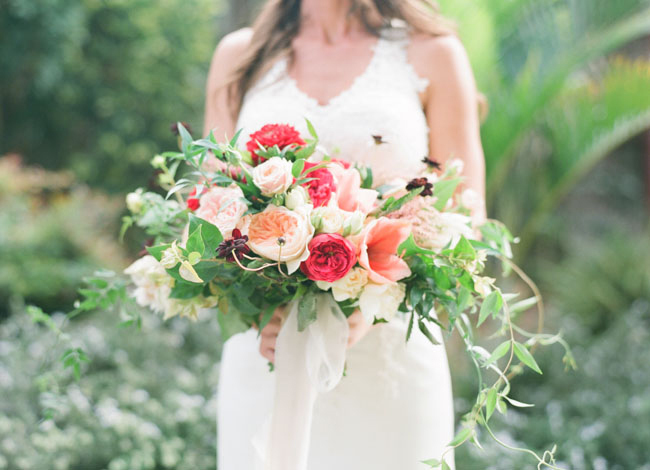 This bouquet includes the following flowers: Peach Amaryllis, Red Dahlias, Peach Juliet, Raspberry and Pale Pink Garden Roses, Creamy White Spray Roses, Chocolate Cosmos (this flower is seasonal so you could sub in a Spray Rose or Chocolate Dahlia), Pink Astilbe, and Ivy (I would use Variegated Ivy just for fun!). We hope you enjoyed this Bouquet Breakdown! As always, if you need a bouquet broken down, just leave a comment with a link to the image and Violet and I will do our best! Want more like this? Check out All of our Bouquet Breakdowns! They are great for getting ideas and seeing what certain flowers actually look like in a bouquet or arrangement and how they look with other flowers!